Arletta and I posed at the back of the Grist Mill building where Jack London wrote in his upstairs office. It is said this building has a ghost. If it does, I like to think it is Jack London's ghost working on another story! the famous American author Jack London looming over our shoulders. It is said the building now has a ghost. Does it? If it does, I like to think it is Jack London working away on another story in his beloved Glen Ellen. Memories of Jack London, author of such notable novels as Call of The Wild, a top rated Y.A. story in its time, and White Fang, abound when one visits the area around Glen Ellen. A California State Park is established there in Jack London’s name, with land from his original Beauty Ranch included in the park. Hiking and horseback riding trails wend through the spectacular settings on the slopes of Sonoma Mtn. I have enjoyed riding my horse on those trails a number of times and viewed ponds and Beauty Ranch projects designed to benefit the ranch and the land. London was an environmental steward of his land–perhaps ahead of his time. In the town of Glen Ellen is a group of buildings known as Jack London Village. There the original grist mill building still features the water wheel which powered the mill. London maintained a writing office upstairs with views of the two creeks next to the grist mill. This was his office away from his home. Our Tuesday morning writers group met and had lunch at Jack London's Grist Mill building where he maintained his writing office upstairs. Maybe some of his great writing will rub off on us! (L-R.:) Shane McGarrett, Arletta Dawdy, Kent Sorensen, Sharon Hamilton, Ron Davys and Robin Moore. It is heartening to know that writers and others may dine and enjoy the peaceful setting next to the creeks, along which the grist mill operated. While we dined on the deck of the Grist Mill, next door is the well known Yeti Restaurant owned and operated by Narayan Somname and his family. They serve delicious Indian and Nepalese food. That was a first for me to enjoy their tasty Nepalese lunch. In mid May they will open the Grist Mill Bar and Grill next door offering American and international dishes. The timber framed opening around the fireplace in the grist mill building makes one think back to the times of Jack London when he was writing upstairs. Doesn’t it pique your interest to know that Jack London penned some of his famous stories overlooking that wooden wheel which was turned by the force of water to power the grist mill? I know it teases my writing muse. Here we are in the upstairs office where Jack London did his writing at the Grist Mill in Glen Ellen, CA. We were treated to views from the upstairs office where Jack London wrote when at Glen Ellen. That room will soon become a banquet room with seating for up to 20-25 people. While we enjoyed seeing the lofty space, the beamed ceilings and the picture windows overlooking the creek I wondered–What might he have written about our Tuesday morning gatherings? I know that Sharon, Kent, Shane, Arletta and Ron are among some of my treasured friends and writing advisors, along with Sandy and Jeanne from the Tuesday afternoon writing group. They are such a help to me! Enjoying the deck at the Grist Mill in Glen Ellen. 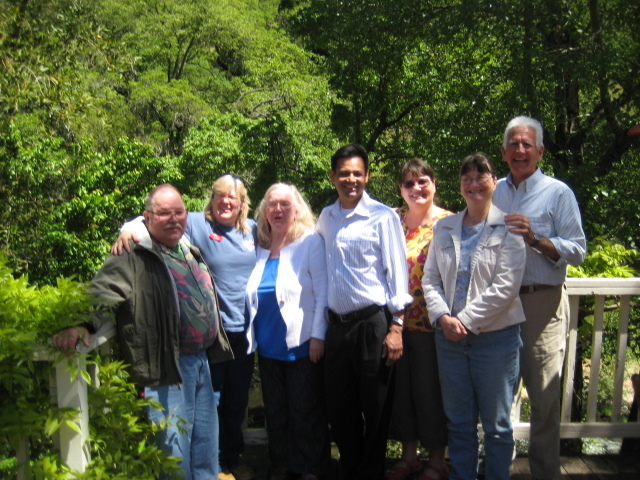 L-R: Ron, Shane, Arletta, restaurant owner Narayan Somname, Sharon, Robin and Kent. Jack London was one of the founders of the California Writers Club over 100 years ago which was established to benefit writers and poets. Along with London were other CWC founding members, including the writers and poets George Sterling, John Muir, Joaquin Miller, and the first California poet laureate, Ina Coolbrith. From their earliest meetings as the California Press Club they set up the foundation of the California Writers Club, a thriving non-profit organization for writers and poets today. Thank you author Kent Sorensen for introducing us to this inspirational setting and these two restaurants. 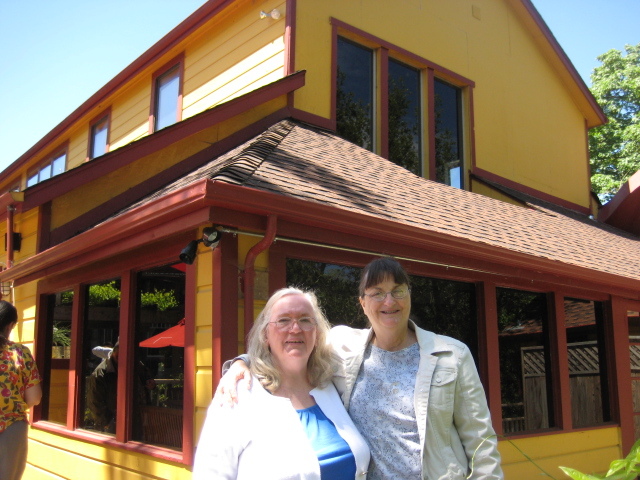 I look forward to our Tuesday writing groups meeting again in the shadows of Jack London’s office there in Glen Ellen. Perhaps next time we’ll enjoy delicious American food served by Narayan and his family when they open the Grist Mill Bar and Grill. Might it be London’s shadow or his ghost observing as we help each other with our writing? 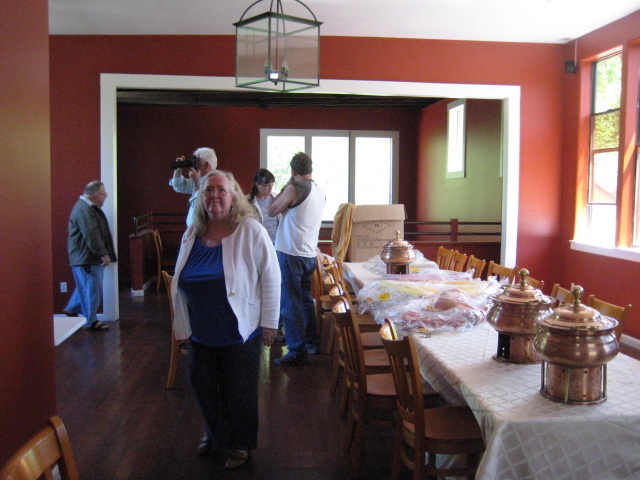 This entry was posted in authors, California Writers Club, dining, ghosts, great stories, Horses, Jack London, Kids' stories, poets, riding, Sonoma County, State Parks, travel, water wheels, Writers. Bookmark the permalink. Beautifully written and heartfelt, Robin. Thanks, Marlene! I debated with myself as to whether I should include you on that list of critique partners–after all, we started out with you as our “Chief”. Thanks again for shaping us into a viable critique group! I can think of no better place for CWC writers than in Jack London’s shadow. Thank you, Violet! 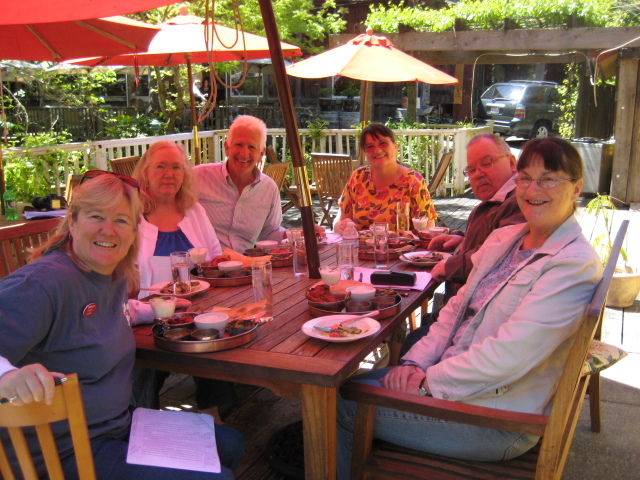 Yes, that is a magical location for writers groups to meet on occasion–and so close to the Bay Area and the rest of Sonoma County. What a special day ! Weather, food and company were all grand. Oh, yes, we also got work done in that exquisite setting. Thanks for writing of our time and let’s look forward to going there again. Thank you, Arletta! Ah yes, that was indeed a special session for our Tuesday morning group. I hope we can go back there again soon. And a big THANK YOU to Kent for setting it up! It’s definitely a facinating place to visit and to dine at. Hope you can make it there to Yeti Restaurant or the Grist Mill Bar and Grill. Thanks, Julie! Robin: Interesting post. It’s good to honor the memory of writers who inspire us. Sounds like he might have been sitting on your shoulder as you wrote about him too. Hope to visit there some time with my writer pals in Napa. It’s a wonderful location for writers, or just hungry diners, to meet. Thanks, Barbara! I loved this post Robin. Thanks for the personal and historical notes. Now I want to go grab my laptop and go to both places. This warm weather is perfect for an outdoor writing session. Thanks, Deborah! It’s certainly easy to visit both restaurants since they sit side-by-side on the same lot along the creeks. Wonderful setting for writers and diners! Family legend has Jack London spending a night at my great-grandfather’s home in rural North Dakota. We always feel like a bit of White Fang belongs to us! Woooo! His “ghost” gets around then! Makes sense that he’d visit there too, since he wrote “White Fang.” Thanks, Sonja! Nice post, Robin. This has always been one of my favorite places and I’m so glad that new people are bringing it back to life. It looks and sounds like you had a beautiful day, and I just know that Jack London was there with you, taking notes and smiling at you Redwood Writers. Thank you, Jeanne! Yes, it was a fantastic morning having the a.m. critique group there. Felt so spiritual and I loved the food! Maybe we can arrange for our p.m. Tuesday group to meet there soon.